A panel on 3D printing at RadTech 2018 included, from left, Josh Hope, Mimaki USA; Maximilian Zieringer, Formlabs; Adam Steege, Trio Labs; Jo Ann Arceneaux, allnex; and Mike Idacavage, Colorado Photopolymer Solutions. RadTech 2018, held in early May in Chicago, Illinois, provided three days where the industrys focus was squarely on education and discussion surrounding the future of UV and EB curing technologies. New to the event was an exhibit theater where cutting-edge panels of industry experts discussed hot UV/EB topics. Summaries of the panel session discussions are included here. Also, in this article is an overview of the RadLaunch presentations, where seven start-up companies shared their innovations. Additionally, they discussed the challenges in using UV for indirect food contact applications. There is a lot of work going on to create low migration UV inks, and even to the point of developments in using nano technology to facilitate this, but it probably will take some time. There also was discussion about water-based UV ink research and how that may mitigate some of the migration concerns in indirect food contact applications. Ultimately the consensus was that UV inkjet will coexist with water-based ink, with each finding their respective applications. The primary application for UV-C LEDs is in the germicidal market space, and companies selling UV-C LED devices see most of their business in that space. The output power of UV-C LEDs now on the market is improving, opening more applications in germicidal and possibly UV curing (some research there now). A wide variety of UV-C wavelengths can be produced, including below 265 nm  question is what does the market need/want? UV-C LED reliability still can be an issue, and even the best, most reliable devices have much shorter lifetimes than their corresponding UV-A cousins. As margins for blue LEDs used for lighting continue to get squeezed, more LED companies are looking to move into the UV-C space. 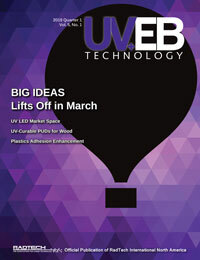 UV-C development typically lags behind visible LED development by five or more years, and performance is expected to improve with increasing investment in this technology. Sensor visibility (LIDAR) and a self-cleaning exterior coating would be very desirable for fleet vehicles like UPS. Manpower with the correct skill set is very difficult to find  it would be an advantage for suppliers to support the training of employees particularly when new technology is launched. Cycle time in paint shops is important  there is infinite value in reducing cycle time. The automotive industry is focused on the future of mobility that includes autonomous vehicles and ride share. For future autonomous vehicles, two areas of great need are self-cleaning coatings and coatings to maximize sensor visibility (LIDAR). Ride share vehicles may have as many as 40 riders per day. A coating with antibacterial performance is of interest to keep these vehicles clean and safe. High scratch/wear resistant coatings also may benefit the interior due to the high passenger traffic. One of the challenges for OEM plant repair is the need for a complete repair paint system (primer/basecoat/clearcoat). Current plant repair utilizes the OEM paint system with catalyst and IR Cure Lamps. One of the reasons that automotive and Ford has not adopted radiation cure coating is that durability has not met requirements. Testing at Ford has not occurred in 10-15 years, so now is the time to look at automotive durability testing. Ford, RadTech and the supply base have begun a testing program in three areas of development that supports the industry, these include: 1) interior UV/EB coating systems, 2) exterior UV/EB clearcoat and 3) 3D printing materials aimed at durability. One of the current road blocks for automotive OEM moving from 3D printed prototype parts to productions parts is the fact that printer suppliers require that their resins are used in conjunction with their printers. Currently the resins supplied by 3D printing companies do not meet durability requirements. There is a strong need for resin development that meets automotive durability requirements. It would make sense that the first use of 3D manufactured parts might be used in interior areas of the vehicle, such as the motor compartment, where UV durability is not as stringent. The panel and audience engaged in a very positive discussion where various topics were addressed ranging from how 3D printing was affecting new materials development efforts at raw material suppliers, such as allnex, to the future of 3D printing. There was consensus among the panelists and the audience that continued materials development was a critical need that will have a significant impact on the industry now and in the future. Adam Steege and Josh Hope represented companies that are developing novel methods of 3D printing new materials and discussed how these specialty types of printing would be an important component of the industry moving forward. A series of questions came up regarding how RadTech will approach the issues of safety when it comes to consumer 3D printing applications. Mike Idacavage spoke out that the 3D printing safety and handling guidelines recently developed by RadTech are a good first step. However, there is not a clear consensus for what RadTech should do in the future to address the issue of safety. The panel wrapped up the discussion with their thoughts on how the 3D printing landscape may look five years from now. All indications are that 3D printing will continue to grow at a rapid rate with increased visibility to the public through K-12 and college education programs, as well as increased market presence. There was also a general consensus that with all of the resources going into new 3D printing companies, that some amount of contraction in the number of companies was inevitable with a few winners emerging. Despite being the inauguration year in 2018, the RadLaunch presentations received great attention from the audience. Seven start-up companies, represented by their founders, shared their innovative ways of utilizing UV-curable techniques for new business opportunities. After each presenters 15-minute talk, the Q&A sessions were merged together, and the discussions delved deeply. It was fascinating to see that UV-curables could be used in so many ways, ranging from recyclable thermosetting materials to orthopedic devices to metal 3D printing systems. Brady Worrell from Dynamic Matter LLC presented their patented new chemistry of incorporating thioesters in the backbone of photopolymers. The extremely rapid thiol-thioester reactions allow such polymers to completely relax externally applied stress, and thus allow the materials to be remoldable and recyclable. The company is a spin-off from Prof. Christopher Bowmans research group at University of Colorado Boulder, and Worrell is expecting their new chemistry soon to be implemented in such applications as optics coatings and reworkable adhesives. Matthew Pearlson from The Foam Printing Project presented SLA 3D printable lightweight foam materials. By emulsifying an SLA resin, they achieved printed parts that are 75% lighter in weight. As a result, the material may obtain a significant increase in economic value per liter resin. Joseph Lomakin from Reboot Medical gave an excellent presentation on the companys new idea of using photopolymer for orthopedic casting and splinting. Taking advantage of the extremely fast curing of reinforced (meth)acrylate photopolymers, Lomakin pointed out that the treatment time can be reduced significantly compared to traditional plaster or fiberglass. As a result, the companys technology, dubbed PhotoCast, can provide a better user experience and reduced time/cost to the patients. Michele Tonizzo from Moi Composite Srl, a spin-off company from Politecnico di Milano University in Italy, presented the companys high-performance 3D-printed composite materials by employing digital design, smart algorithms and robotic arms. The key of their technology is to optimize the position and the direction of reinforcing fibers, and smart design according to the in situ stress of the material, so as to obtain properties sufficient for the real-world use. Nir Waiskopf from the Hebrew University of Jerusalem talked about the latest discoveries in the field of photocatalytic colloidal quantum nanomaterials. One of the interesting implementations is to use such nanoparticles as water soluble free-radical photoinitiators. It is well known that the choice for water-soluble visible light photoinitiators is limited. For applications including biomedical devices for tissue engineering, it is of great importance to develop a nontoxic, efficient and biological friendly photoinitiator and thus enable SLA 3D printing of such materials. Adam Steege from Trio Labs shared their initiatives on metal 3D printing. His talk started with the background of metal injection molding and then explained how the companys proposed technology could achieve production ready, high precision and high-volume 3D printing of metals. The benefit of the companys technology is utilizing many established resources readily available in the metal injection molding industry, including raw materials, and post-printing processing apparatus. Prof. Julie Jessop from the University of Iowa proposed her innovative concept of transferrable shadow cure in the field of cationic curing epoxy. It is well known that curing depth is a major limitation for many photocurable systems, even in cationic systems. Jessop designs pre-activated cationic prepolymers that are readily transferrable to any desired resin and thus achieve enhanced shadow/dark cure benefited from the long-lasting cationic reactive species.